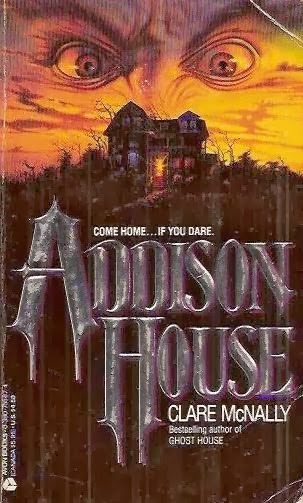 Addison House is an old-fashioned ghost story. Doreen Addison is foster mother to a group of orphans who moves her entire family into an abandoned and run-down old house. The house has been empty for decades and rumored to be haunted, which has deterred would-be renters from moving in. But Doreen refuses to let old rumors and superstitions prevent her and her family from moving into the dream house they've always wanted. Just days after Doreen and her children move into Addison House, the workers she's hired to fix up the place start to have accidents, and people start dying. It's not long before Doreen's own children are starting to act strangely under the influence of ghosts and become victims themselves. Doreen must then come to grips with the house's past, and decide whether she wants to stay and battle it out with the ghosts and demons or move her family out before they all die. Addison House is classic horror camp. The dialog is cheesy, the story is cheesy, and even Doreen's romance with the ghost man is cheesy. (The fact that the boyfriend is a ghost is easy to spot from a mile away.) But it's the demon- and ghost-possessed children that really make this novel spooky and creepy. It's not one of McNally's best by far, but I didn't exactly grow bored with the book either. There are no surprises in Addison House, so don't anyone give me a hard time about revealing these here spoilers!!! In the end, the demons are exorcised, the ghosts resolve their "unfinished business," and everyone lives happily ever after - even though a few lives are lost in the process. So, again - if you enjoy old-fashioned ghost stories, then Addison House is for you. If you're looking for a horror novel with an unexpected twist, steer clear of this one. Have you read Clare McNally, and if so, which novels did you enjoy the most? Who are your favorite horror novelists? Share your comments with us below!